Elix® pure water then recirculates through a loop where it is irradiated by a long-life bactericidal UV lamp before entering the storage tank. The reservoir design maintains consistent purity of stored water. The vent filter provides effective protection against airborne contaminants and the ASM, Automatic Sanitization Module, prevents biofilm formation. Elix® Water can be accessed through the E-POD® dispenser or it can be sent by a distribution pump to feed instruments. The Progard®cartridge incorporates RFID technology. This provides instant visibility on cartridge parameters and also ensures a safe & optimal performance of your system, giving you full traceability. Get the right water quality for your experiments – Fitted to each E-POD®, an Application-Pak provides final polishing to match the water quality according to your application’s exact needs. Millipak® and Biopak® final filters are available – Pure water free of particulates, bacteria, pyrogens, RNases and DNases. Facilitate your daily lab work – The E-POD® remote dispenser is always within reach. Its convenient and adaptable handling enables both intuitive and precise dispensing. The user can select either a specific volume with the autofill key or manually press the plunger. Its multicolor graphic display allows easy interaction with the system and provides information about water quantity and quality. Free up space on your bench – As only the E-POD® is necessary for daily needs, the system can now be placed where it is most convenient – under the bench, on the wall… Up to three E-POD®s can be used with each production unit at different locations within the same laboratory. 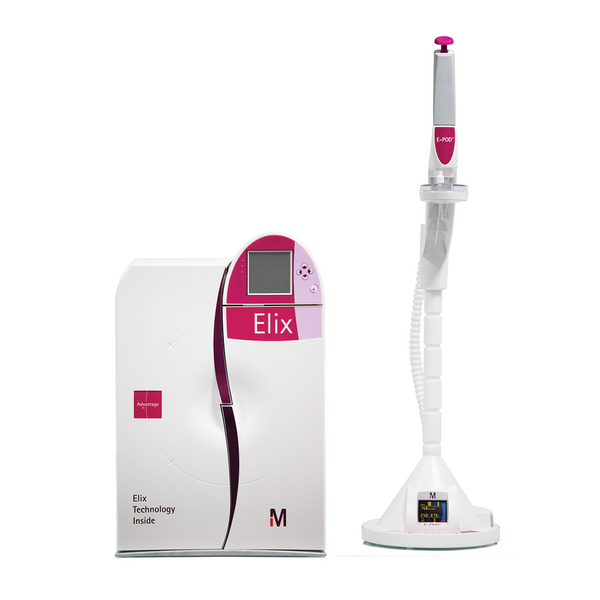 For full confidence in your Elix® Advantage system, it is delivered with a Certificate of Calibration for the built-in temperature and resistivity meters, and aCertificate of Conformity ensuring that it has been built and tested fully assembled following internal Standard Operating Procedures. In addition, all Elix®Advantage consumables are delivered with their Certificate of Quality. The manufacturing site is ISO® 9001 v.2000 and ISO® 140001 certified.